The Acadian Greenhouse is a beautiful, well built greenhouse. It is designed to withstand 85 mph wind loads, and 32 psf snow loads. Our frames come with a limited lifetime warranty. It is manufactured in an ISO 9001:2000 factory certified for quality process and procedures assuring you of this quality. The aluminum frame comes with a baked on enamel in white, brown or green. All of our glass is single tempered glass. We do offer the option of a multiwall polycarbonate roof at no additional charge. This gives you the strength of polycarbonate in your roof, and some additional insulation. 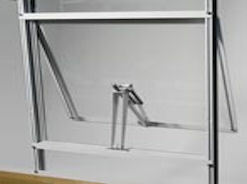 The glass panels are held securely into the frame. There is no W wire, as in some other greenhouses. You place 2 sided tape on the glazing bar, place your glass, then you screw a glazing cap over top of that. 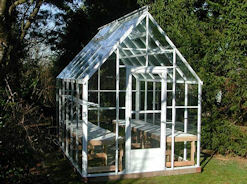 The glazing cap is securely fastened to the frame of the greenhouse. These frames are so strong you can put a 50 pound hanging basket on every roof bar! Our roof vents are oversize at 20″ x 48″. They come with a solar powered opener. This has a wax cylinder that works on contraction and expansion. When the wax gets hot, it expands and pushes the vent open. Our weather tight vent frame for roof and side vents is accomplished because the sliders, vent frames and ridge beam have a weather stripping added to them. The sidewalls are 5′ 6″ on these greenhouses. The roof peak will depend on what style of roof you choose. We have 3 roof styles to match your home, or to accommodate taller plants. All materials are pre- cut for ease of assembly. The screws and bolts are all stainless steel. All required capping and caulking are provided. The door is a premium 1 1/2″ combination glass/screen door with a key lock so you can secure your greenhouse and get added ventilation. The door can be hinged on the right hand side or the left hand side, unless otherwise indicated. You determine this by facing the greenhouse from the outside. If you want to build a knee wall on site, we will adjust the door frame for you at no charge. We call this a door drop. We also offer side vents for the Acadian Greenhouse. In conjunction with the roof vents, this will provide a natural ventilation for your greenhouse. We also offer ventilation packages including motorized exhaust fans, intake shutters with a thermostat. 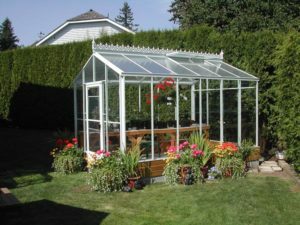 Add all of these standard features up, and you will find a superior greenhouse for a great price. 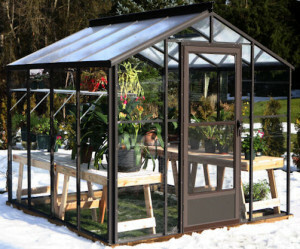 There are many different sizes available for this greenhouse. If you do not see the size you want below, please contact us. The optional side vent, working with the roof vents, allows for natural ventilation. 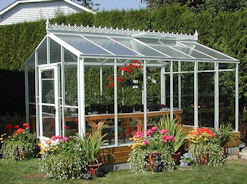 This Acadian Greenhouse shows our standard roof with the optional Victorian Trim. 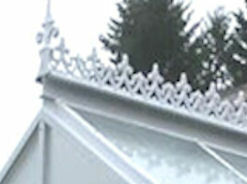 This heavy cast aluminum Victorian Ridge and Finials will set your greenhouse apart. 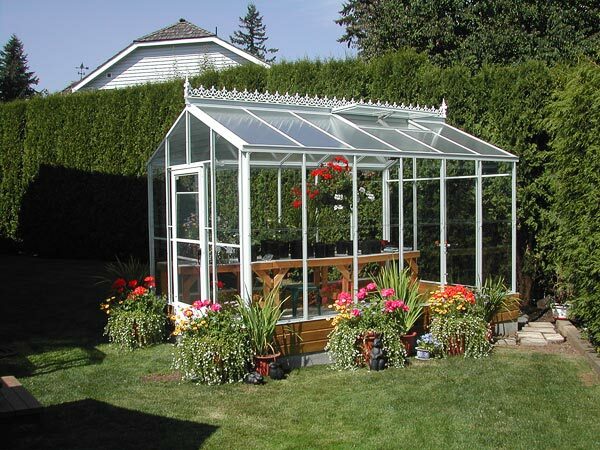 The color of this trim will match your greenhouse frame. This picture shows our Acadian Greenhouse with Intermediate Roof. Concerned about installation? View a copy of a representational installation manual. 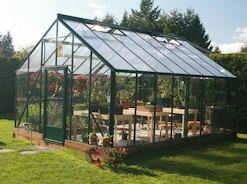 Please, when installing, always use the manual that comes with your greenhouse, as there may be slight changes. All of the pieces are pre cut. Each wall is taped together in a bundle so that it is easier to lay out the greenhouse without searching for all of the parts. 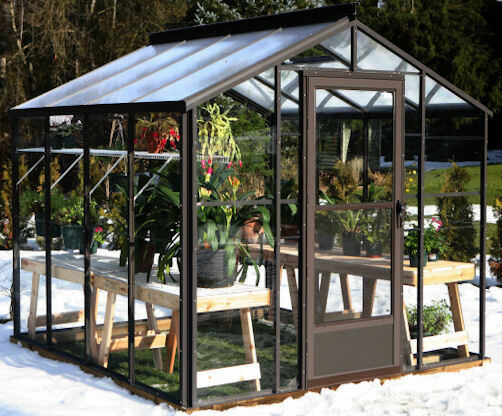 This greenhouse is bolted together for additional strength, no snap and lock pieces here. This picture shows our highest roof peak, the Cathedral Roof. *There may be additional shipping for remote locations. Ships by truck. You are responsible for unloading.